I've been to England about 5 times but I never tried the crumpet there! I always wondered what it was, was it just a saying? But then an Anglophile from Sweden went to London recently and brought us back a pack of Waitrose crumpets. These are the kinds of gifts I love, because what better way to explore and understand the world than with food? The Waitrose crumpets looked delicious. They had many holes but looked similar to an English muffin. We were told to use lots of butter on them after toasting them and we did as we were told. 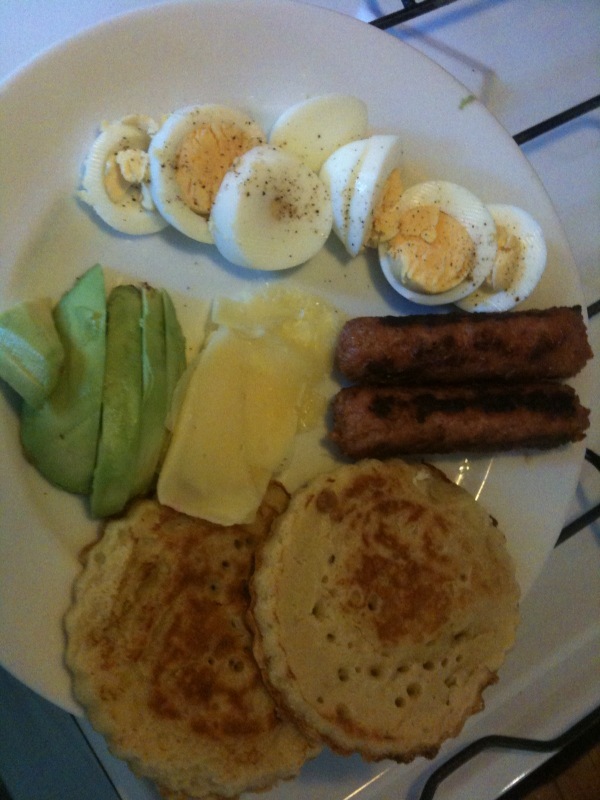 We ate them with a side of eggs and veggie sausages and a cup o' tea. My first bite and there started an obsession... It was chewy, soft, moist, buttery, toasty on top, and the center was almost like an unsweetened cake. We ate them with cloudberry jam (hjörtron sylt på svenska) and today I ate them with good cheddar, but it tastes so delicious just with good butter! 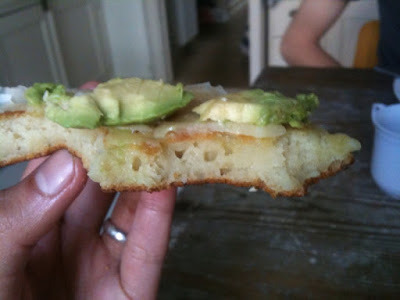 So I decided that I must re-create our special breakfast and learn to make crumpets. I explored a lot of recipes. Last weekend I made my first batch but since I had never made it before, I made the batter too thin and then I didn't let them cook until the top was almost dry so it was a raw mess. But I simply couldn't give up. So last night I made my next batch - it was so easy - just proof yeast with milk, then add flour, salt and oil together and let it sit overnight. In the morning I added baking soda before my shower and after my shower (30 minutes of efficiency), the batter was waiting for me to cook. 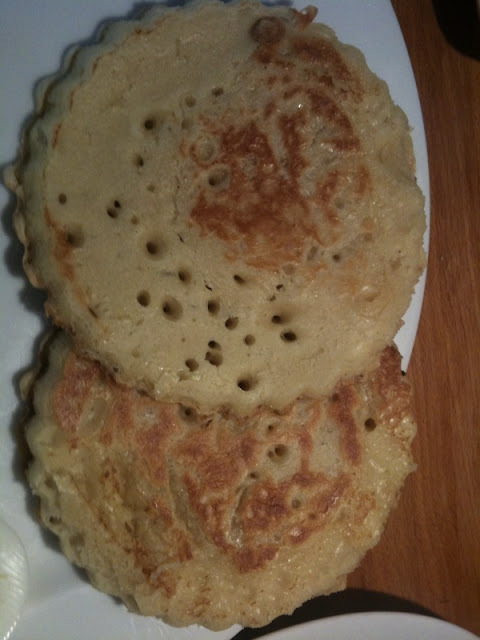 I was happy with the result of my crumpets because they have holes and were quite delicious and tender, but the Waitrose ones had more holes, so I'm wondering what their secret is. What's the real difference between baking soda and baking powder now? Some recipes say soda while others say powder. The extra leavening is essential to making those craters for the butter to fall into... So I will keep working on that. Some people use egg rings, some buy special crumpet molds, and some take off the paper and bottoms (and tops) of cans. I tried using the can molds but it was a downright mess since I only had the big cans and the batter kept sticking to them, which made it hard to flip. I finally figured out that I could use my mini tart shells (without their removable bottoms) and that turned out perfect also because they're non-stick. I imagine one could also use cookie-cutters but I haven't tried that since I don't have any here in Stockholm! In a large mixing bowl, proof the yeast: Add warm milk (not too hot or it will kill the yeast), sugar and yeast and mix. When you see bubbles and/or froth on top of the milk, it's ready. 3 - 5 minutes. Add flour, salt, oil to the milk mixture and beat with spatula for about 2 minutes, to activate the gluten. In the morning, mix water and baking soda and stir into the bubbly mixture. If the batter looks too thick, add a little water, but you want it to be like a thick-ish pancake batter. Leave for 30 minutes. Preheat the griddle or pan on medium-low heat and grease with butter. Grease mini tart molds or cans that have been washed and had their bottoms and tops removed and preheat in pan. Add about 2 inches of batter to each mold. You will see bubbles starting to appear. When the surface looks almost dry, turn them over. (You may need to run a knife around the edges of your can molds.) Cook for 1 - 2 minutes on the other side. When ready to eat, toast the cooked crumpet, then douse with good butter or cheese. Enjoy their pillowy softness with a cup o' tea. You must try Crumbly Lancashire Cheese - it is simply delicious and exceptional when you go to England next, and I shall try Red Leicester!